Dr. Thich Thien-An founded the International Buddist Meditation Center in the Mid-Wilshire area of Los Angeles in 1968. I came — after a diversion of living a normal life in La Jolla for a time — to I.B.M.C. in 1972 and was ordained the next year into Tien-An's school of Mahayana Buddhism, that was particularly influenced by Chinese Zen. He had earlier been made Patriarch of Zen by his order in Vietnam. This was before the fall of Saigon. After that, we became very involved in housing and finding permanent families for their placement. Tien-An's life centered around his constant gardening, teaching peacefulness and peace, and trying to bring the Buddhist world together, work carried on by my Dharma sister, Karuna Dharma, now the abbess. Tien-An always prepared the hottest soup imaginable for the manditory Saturday work sessions. We would all sweat profusely and wish we were elsewhere. His nickname was Suto. I wonderd why he was considered a Zen master when all his talks were about peace and not enlightenment. This area of LA was the home of several Zen centers during n 1970-90, including the Los Angeles Zen Center under Maezumi Roshi, Sambosa under Seung Sahn, Cimmarron Zen Center under Sasaki Roshi and Kozan Roshi had an apartment in the area. Many, many Buddhist temples located in this area later, especially the Tibetan, and some remain. The Buddhists have four main holidays a year. Twice a year at the main festivals, Tien-An organized "processions" in the predominently Latino neighborhood. We would have 80-100 robed monks and laypersons walking several blocks around between several temples. I always thought the processions colorful but funny. At the head of the procession would be Carl Haysock, now a monk in Korea, blowing a 12 foot Tibetan horn. Just behind him were two drumers with Vietnamese drums. Just behind them were four laypersons carrying a golden Buddha statute containing a relic of the Buddha Gautama--a tooth. Behind them came the monks, in order of mastery and seniority. This had two purposes: bring curiosity, awareness and acceptance of our existence to the neighborhood, and build a foundation towards Buddhist unity. The latter never happened. Thich Thien-An in the rear at front of procession. The above photo contains four Zen masters: Dr. Thich Thien-An in the rear at the front of the procession, walking behind Dr. Ananda, a very sweet man who died of a massive heart attack two years after this photo was taken; walking side-by-side, Seung Sahn Soen Sa and Maezumi Roshi; Kozan Roshi, an unassuming Zen master if there ever were one, brought up the rear. As you can see, although Seung Sahn was a new arrival, he had no problem working his way to the front. He had enormous self-confidence as well as the desire to be recognized. Robert, on the other hand, would never have been in the photo anywhere. He would have be standing behind the photographer. I liked Kozan. There was nothing about ritual or text learning about him. He was very earthy without being crude, and very opinionated. He had a very pretty, 20-year old translator living with him, Myosaka. I had a crush on her. Might still if she showed up. He used to joke, "I bet you wonder what our relationship is." Whatever it was, I was envious. Anyway, he was always beating on her figuratively, trying to make her a good Zen student. Kozan was aware of everything from a pragmatic perspective. He had a great sense of humor. I was always brash with him and he attempted to tame me by calling me "Mr. Ed." At that time, Mr. Ed was the talking horse in the TV series. We all laughed. Unfortunately, Kozan began developing health problems that appeared to be stress related. We talked frankly and he said he knew it was stress, but he had no money for medical treatment here. None of his students had enough money to help him out, so he returned to Okinawa. Myosaka wrote me two years later that Kozan was doing the same thing, preventing her form taking a job to support both of them, rather than being by his side constantly, absorbing his Zen. My great mistake was merely to say I had a crush on her rather than respond to her need. I never heard from her again. Although not in this particular procession, often was Hsun Hua, Abbott of Gold Mountain Monastery in San Francisco. He is the only Zen man I felt had that same energy as Robert. He always had a bemused smile on his face, looking on at life as if it were a quiet joke. However, when I later read his Dharma talks, they were quite ordinary and traditional. My place, as a junior monk, was about 20 feet behind Kozan Roshi. This is a very rare photograph of Kozan. 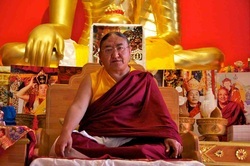 Sakya Tenzin, head of the Sakya sect of Tibetan Buddhism, one of the big four. He stayed at our center for about a month. This was about a year after the Dalai Lama stayed at our center when he first came to the United States. The Dalai Lama was the head of the Karmapa sect, the largest of the Tibetan orders. Sakya, I think, was a very ordinary man and not in a nice way. Some would call Tien-An's vision of a united and peaceful world one that can never be. He died before he could even pull most of the Buddhist world together. In the largest sense, Karuna Dharma, Abbess of IBMC (see below) carries on his work of peace, although in her own way. In the late 1980's, Los Angeles had a second chance to get its Buddhist act together when Karuna invited an impish monk from Sri Lanka to stay at IBMC. Dr. Ratanasara always had a ready grin and laugh, and also a large vision of a national Buddhist Congress. Ratansara's ambition was to recruit the best and brightest in an effort to unify Buddhism. Naturally, he chose me. We tried to rebuild the College. He founded the Southern California Buddhist Council and then the American Buddhist Congress. Unfortunately, it didn't work. The different temples were just too different in terms of language, belief systems, and the degree of cultural isolation. He died a few years ago of heart failure. The last few meetings of the American Buddhist Congress had less than six council members attending. Part of the problem was that Ratanasara was first and foremost an academic. He tried to invade and win the West with Western-style means, as did Tien-An, while Americans were looking for answers from outside their box. Ven. 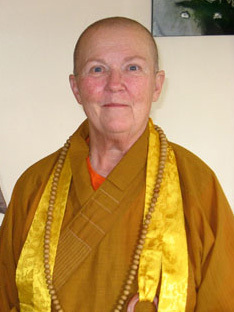 Dr. Karuna Dharma (Thich An-Tu) took full ordination in 1976, becoming one of the first American women to take bhikkuni ordination in the United States. She met her teacher, Ven. Thich Thien-An, and began her studies of Buddhism in 1969. She was a founding members of the International Buddhist Meditation Center. Ven. Karuna has been the Abbess of IBMC since Ven. Thich Thien-An died in 1980.